As you move farther into the adult world or, for some, as you continue to rebuild after several bad years related to the most recent recession, your credit becomes more and more important. It’s possible to survive the majority of your adult life without good credit, but valuable things like cars, houses, rent, and big purchases tend to cost a whole lot less over time if you have a passable credit score to show. You probably consider your credit score when you’re applying for a car loan to purchase a new vehicle, but you likely don’t think about how your credit affects the cost of trying to insure your new purchase. Your credit is a factor with many different insurance companies, and it’s something you definitely have to remember when it looks like a bill may become 30 days passed due. If a car insurance company runs credit and finds a poor payment history or other negative items against the applicant, they often use that as justification to charge higher premiums or, worse, deny coverage all together. There are good drivers in the world who have never had an accident or citation who are still unable to get coverage because they have a negative history of debt or late payments. The score used to determine cost and coverage is not the same score as the one a credit card company would use in order to determine if you qualify for credit. The figure that is used is similar, but it takes additional things into account when providing a score that represents the risk involved in insuring you. Past due accounts, credit history and percentage of credit utilized are important parts of the insurance score, and someone with a poor history of all of those things will have trouble getting insurance or may face higher premiums. Insurance scores, however, also consider accident history and risk of loss. Your FICO credit score would not have that information. Insurance scores are inconvenient for those who are applying for insurance for the first time or who are trying to rebuild their credit from a bad period. The score can be the reason that some consumers have to spend more money to get the same coverage that neighbors get for very little. Insurance companies, on the other hand, rely on insurance scores in huge numbers because they offer an objective way to predict risk in choosing to insure someone. 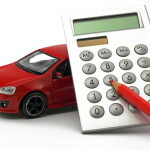 They use a mathematically established formula to determine if your driving history is worth insuring. There is a contingency of people who are not keen on insurance scores, and two states have already outlawed them. Other states have lawmakers who continually lobby to address the frustrations that consumers experience while applying for car insurance. These groups believe that credit history and accident history are separate issues that should not be considered together when determining premiums for those in need of coverage. If you believed that your credit score only mattered for big purchases and loans, then your next trip for car insurance could be a rude awakening. Companies all over the country are considering your insurance score before extending coverage. The good reasons that you may have for the blemishes on your credit report don’t matter when companies only see your number. As a result, get your free credit report (your entitled to one free report a year) and check it to make sure that it’s correct. Remember the price of your auto insurance is not solely based off of your driving record, so be diligent and protect your credit.